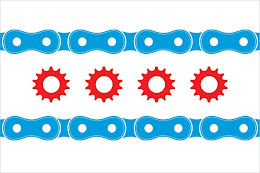 The League of American Bicyclists has ranked the State of Illinois as the #11 most "Bicycle Friendly State." The League issued a report card for each state based on: 1)Legislation and Enforcement; 2) Policies and Programs; 3) Infrastructure and Funding; 4) Education and Encouragement; and 5) Evaluation and Planning. Illinois scored a 4 out of 5 in Legislation and Enforcement, Policies and Programs and Education and Encouragement. The Land of Lincoln scored a 3 out of 5 in Infrastructure and Funding and only a 2 out of 5 in Evaluation and Planning. The Illinois Bicycle Lawyers at Keating Law Offices have worked with state and local politicians and advocacy groups on many of Illinois' bicycling legislation, policies, programs, and plans. This may be a fair ranking if one were to look at the State of Illinois generally. But given that a majority of our population lives in or around Chicago, and the City and many suburbs have made major strides in being bike friendly, I think this metropolitan influence should have given the Prairie State a higher score. That said, it is a reminder that there is a lot of work to be done. One very accurate criticism by the League is that Illinois lacks an all-ages cellphone ban that would prohibit talking/texting while driving and reduce the number of bicycle accidents from distracted driving. The bicycle accident attorneys at Keating Law Offices have handled several cases involving distracted drivers who caused a bicycle accident. The unfortunate reality for bicyclists is that what might be a fender-bender for a car is usually a trip in an ambulance to the ER for a bicyclist after a bicycle accident. The number of distracted driving cases is simply inexcusable. Forbes Magazine has a nice summary of the ranking by the League of American Bicyclists that you can find by clicking here.